At ATS Euromaster we are happy to provide you with a choice of wheel alignment options so you can find the best value solution for you and your vehicle. You can choose from our standard laser wheel alignment for your front wheels or computerised alignment for your front and rear wheels for more accurate adjustments to bring your car back to its original factory settings and ensure your tyres are in the most optimum position. 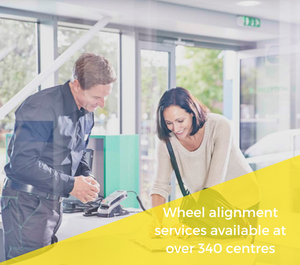 We have over 250 local centres throughout the UK that can carry out wheel alignment services. You can book an hourly appointment online today at a date and time to suit you. Wheel alignment normally takes around 30 minutes (this can vary depending on vehicle) to complete and you can enjoy free Wi-Fi and coffee while you wait. What is wheel alignment, or tracking? 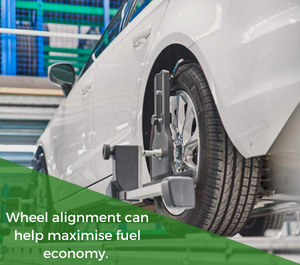 Wheel alignment (sometimes referred to as tracking) is a service that involves correcting the angles of your wheels so that they are accurately re-set to the original manufacturer's specification. It’s recommended to get this checked whenever you replace your Tyres, as, over time, the rigours of driving on the road can cause your wheels to become misaligned. You may need to have your wheels aligned if your car has recently had a more significant knock or impact, such as going through a deep pothole. For the best performance, you ideally want to have as much of the surface area of the tyre to be in contact with the ground as possible. Getting your Wheel Alignment checked and adjusted regularly will help optimise your vehicle's fuel consumption, road handling and tyre life. Misaligned wheels can lead to uneven tyre wear and shorter tyre life, meaning you will need to get your tyres replacing sooner than normal. Our prices start from £37 for a 2 wheel laser alignment. We also offer 2 and 4 wheel computerised wheel alignment which costs £65. You can book your vehicle in for a wheel alignment online today with hourly appointments available throughout the UK. Extend the life of your tyres and avoid premature wear - get your front axle tracking adjusted today. Front axle wheel alignment using the latest computerised equipment. Book online today. Front and rear axle wheel alignment using the latest computerised equipment. Book online today. Our Laser Wheel Alignment service sets your vehicles wheel positions back in line with manufacturer guidelines. 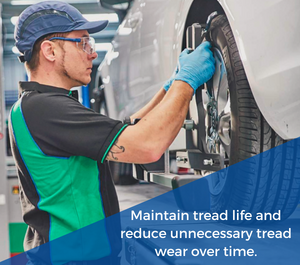 Our expert technicians will ensure your front wheels are correctly aligned to the optimum position measuring and adjusting your wheels using laser technology to ensure your car handles well, and that you get the most life out of your tyres. Our Digital/computerised wheel alignment provides the highest degree of accuracy and ensures your tyres are set back to the exactly to the vehicle manufacturer’s original angles and the optimum position. Our digital equipment also features a simple to understand Reception viewing screen, so you can view the pre and post readings according to the manufacturer’s original specifications and see the adjustments made in real time, giving you extra peace of mind. You will also be able to request before and after print outs of your alignment so you can keep a record of the improvements made. If you believe your alignment is out and needs adjusting feel free to find your local centre and get in touch with them, they will be happy to assist or perform a check before you book anything. For most cars, there are no specific requirements. 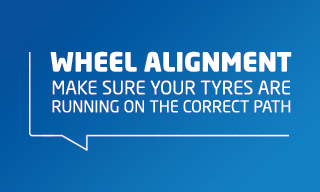 It is common that wheel alignment is checked when a vehicle is having new tyres fitted. Over time, and through potholes and mounting curbs a car’s wheel alignment can be impacted. If you regularly check the conditions of your tyres you should be able to spot the signs that your alignment is out. As shown in the image above there are various different types of misalignment positions that can occur. These toe in, toe out, positive camber or negative camber. If your vehicle is pulling to one side it could be a result of incorrect toe alignment. “Toe” looks at whether your front tyres are closer or further apart compared to the rear tyres. Depending on your vehicle it may need different toe settings compensating for the way your wheels wil either pull towards each other or away. “Camber” simply means the tilt of your tyre, it can be inward or outward. Camber is set by the vehicle manufacturer. Your camber alignment can be knocked off by driving through pot holes and other forms of impact on your wheels. This is the most common form of misalignment and therefore may need to be checked and adjusted periodically.